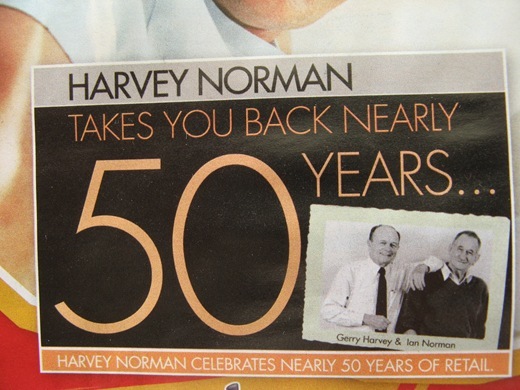 Ridiculous Advertising Campaign – Harvey Norman Celebrates Nearly 50 Years Of Retail | Where is Joe.in? I guess Harvey Norman needed a new excuse for the current instalment in their continuous series of sales promoting overpriced televisions, computers and lounge suites. Harvey Norman’s first store opened in 1961. I can imagine a junior copywriter at Harvey Norman’s marketing meeting coming up with the sensible idea of celebrating 47 years in business only to be overruled by an executive with the ‘nearly 50 years’ brain explosion of a slogan. Will Harvey Norman also have ‘nearly 50 years old’ sales in 2009 and 2010 as well? Could you imagine people organising nearly 50 (or 30, 40 or 60) years old birthday parties? In defence of Harvey Norman, they could have the same campaign next year and it would not be noticed due to the monotonous regularity of their promotions. Their average target market member would not remember 2008’s identical sale. Humm Is the 50 years taking into account the years after he was sacked by Alan Bond and Norman Ross went broke? The Current Harvey Norman / Caviton Ltd was formed in 1987.
and the exec’s damage control and idea for new advertising “Nearly 50 years” boss!